The 35′ Coachmen Mirada 350DSA is a large, top of the line bunkhouse coach. It feature a basement-style storage design which has a ton of room for your long road trip. The motorhome has 2 slides; one huge slide in the living room providing a large living area when fully extended. The unit also features a huge bunkhouse/bedroom slide as well. This unit is ideal if you are looking for tons of living space, large bedroom, tons of storage, and need to sleep a large family. The unit has a dinette that folds into a bed, a couch with a pull-out sofa, 2 bunk beds (large enough for adults) and a rear queen bed in the private bedroom. The coach will sleep 7-8 in 5 beds: Bedroom, bunkhouse, Pull-Out Sofa, & Dinette. This is a complex motorhome with a lot of bells and whistles, previous RV-ing experience is recommended. You will find numerous very large outdoor storage compartments including pass-through storage. The 35′ Coachmen Mirada has tons of space for your family, and all the camping gear you want to bring along. 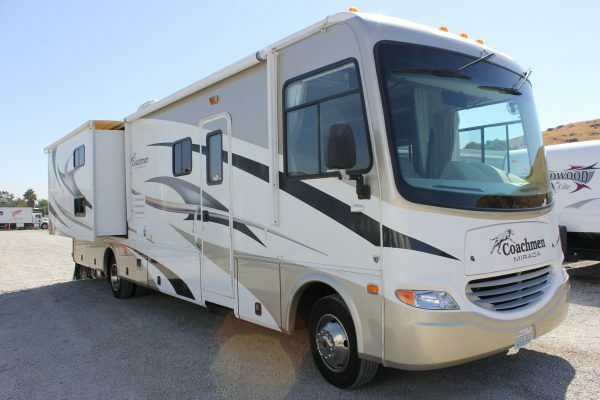 Fully-Loaded with every available feature & option, this is a complex motorhome great for experienced travelers. This motorhome has current stylings, touchscreen CarPlay Radio, LED TV in the living area, & easy to clean vinyl flooring.